Check out this amazing picnic! No, this was not my birthday picnic. This was Brandi Henderson's wedding! Brandi is the founder of The Pantry, an amazing Seattle community kitchen and cooking school. Here's my more humble birthday picnic. I regret not taking the time to whip out the camera, back up, and take a big picture of my amazing friends who came out to celebrate with me. My crafty friends and me, scheming about our upcoming Farmhouse Retreat! It has always been a dream of mine to host a big picnic party, and living in Toronto, what better setting than beautiful, urban High Park? 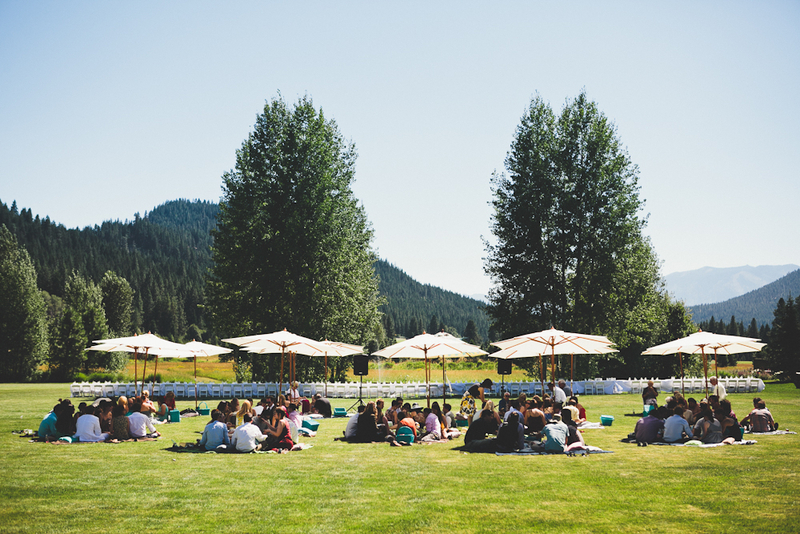 After failing to book a picnic site last year because I only called one month in advance (yes, every single picnic area was booked for the month of July when I called in May/June) I decided to book the event in March -- a whole 4 months in advance. That gave me 4 months to dream up my ideal picnic menu. Maybe some ideas for my farmhouse retreat in September?? It was a group of about 60 people, so I wanted to keep the food simple. Starting with snacks, I pulled out all my favourites: cheetos, ringolos, skittles, m&ms, and your classic brown paper lunch bag to fill and bring back to your picnic blanket. I set up a sandwich station with a variety of deli meats and delicious cheeses, homemade pickled peppers, arugula, fluffy buns. We also offered a grilling station to warm your sandwich if desired. To keep ingredients cool in the summer heat, I used double foil pans and filled the bottom pan with ice. A perfect trick that kept the meat and cheese cool for several hours. I avoided the typical mayonnaise filled salads (despite my love for them) and opted for a healthy mexican quinoa salad. This salad deserves a post on its own, but suffice to say it was packed with flavour. Corn, red onion, tomatoes, cilantro, limes: heaven. A summer picnic event would not be complete without watermelon or corn on the cob. I read a great tip on how to cook corn on the cob for a large group and it turned out beautifully. I put my cleaned cobs of corn into a cooler (also scrubbed clean) and added a large pot of boiling water. Close the lid. The corn's ready to eat in 20 mins, and it stays ready to eat for hours. My dessert had to be birthday cake, but something that would stand up to the heat. I didn't want to have to pull out the forks and deal with messy icing, so I settled on my favourite pound cake recipe and created three different flavours: grapefruit, strawberry jam, and chocolate vanilla. Pound cake freezes beautifully, so when my friends asked how I had time to bake 6 pound cakes, I explained that I just did it throughout the week and froze them. The perfect cake to eat by hand. The weather for my birthday picnic was surprisingly perfect. Little humidity, full sun, not too hot. It was probably the best Toronto weather all month. I hope you're all enjoying your summer and making time for good food and good friends! Following several requests (always so flattering), recipes for the pound cake and quinoa salad will be posted soon! Photo credits to Em and Dan.